Now is your chance to live in the prestigious 55+ Grand Reserve resort style condo community. This custom built 2200 sq. 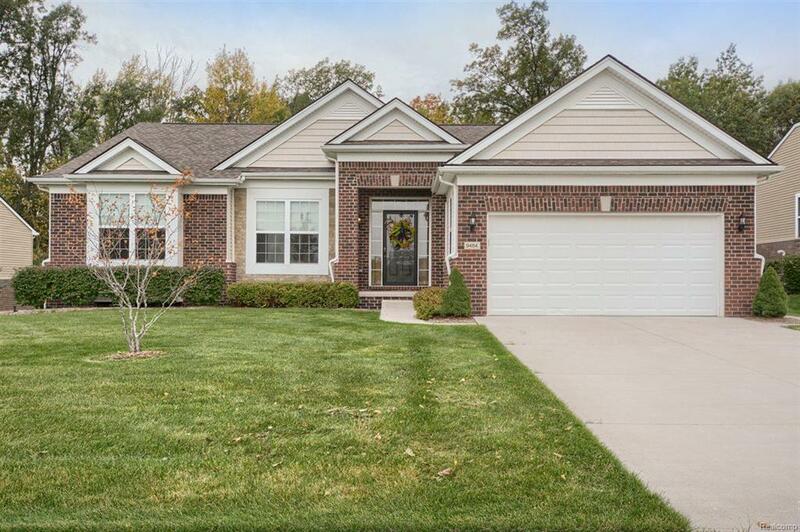 ft. ranch features stunning upgrades from top to bottom. Enjoy a contemporary open floor plan perfect for entertaining equipped with 9 ft ceilings, granite countertops in the kitchen/bathrooms, beautiful hardwood floors, first floor laundry with shelving, and French doors that lead to an executive office. The sunshine lights up the private master suite through the bay window, and includes a spacious walk-in closest, large bathroom with a sunken jetted tub, walk-in shower and dual granite sinks. The beautiful garden room addition on the back of the house offers amazing year round views of wild life and leads to a huge composite deck overlooking the secluded back yard. Other upgrades include invisible fence, 75 gallon water tank, UV film on windows, custom shelving in closets, crown molding , and a tray ceiling in the master bedroom, and basement daylight windows.